web – Hayes Raffle Ph.D.
Story Visit is a website where children and long-distance loved ones can read story books together. 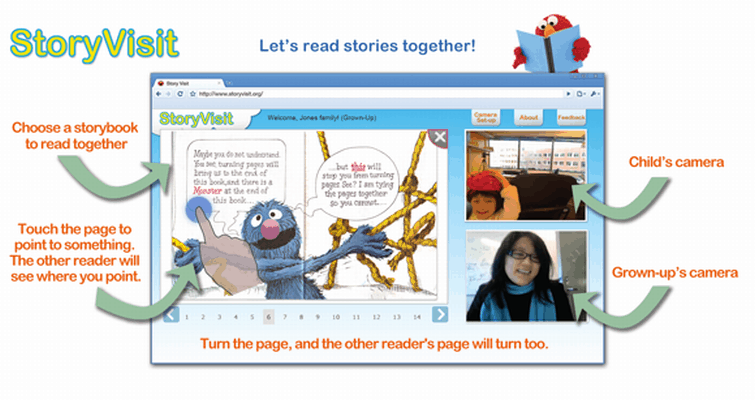 Story Visit combines video conferencing and connected story books: when a grown-up turns the page, the child’s page turns along with it. If the child points to something on his screen, the grown-up can see that on her screen too. Now families can read stories together even when they can’t be in the same place. Our research showed that conversations with 3 year olds increased from several minutes (in a typical video call) to 15-20 minutes when they used Story Visit. Reading books together really is more fun! With email, why does a love letter have to look the same as a business letter? We invented Fuzzmail to give people’s typed communications more emotional breadth. Fuzzmail records the act of writing and lets the author send it as an email. Dynamic changes, typoes, pauses and writeovers are captured and communicated. Fuzzmail was created to provide a more emotionally expressive alternative to email, so that an emailed love letter does not have to look the same as a business letter. You can check out one of my favorites about family and caffeine here. Fuzzmail allows you to create more expressive text communications by incorporating dramatic timing and rhythm into the content of the written message. The act of writing becomes more like singing or acting. A fuzzmail may be a carefully scripted performance or a spontaneous creation. Give Fuzzmail a try at http://www.fuzzmail.org. Check it out in a separate window. The Rafelandia website is an archive of my work from 1992-2002, presented as a full flash website. My sculpture, titled “love” is buried there among associations and metaphors, and some of my older professional work – “money” – is presented with detailed attention to aesthetics. The site design is intended to reveal related work to web surfers who dive deeper into content that interests them, but it is a bit cumbersome for my speedier approach to viewing most websites today. Check it out in the frame above, or in a separate window. This site was designed and built in collaboration with mogeworks design.